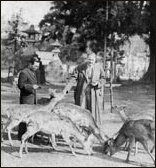 In 1912, Dard and Edith moved to Marlborough, New York and purchased a historic house built by Louis Moses Gomez in 1714. 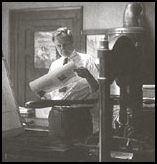 At this time, there was no handmade paper being produced in America – artists and printers had to rely on European paper for their needs. It was Hunter’s goal to change this. By 1913, Hunter had built a 16 x 14’ paper mill on Jew’s Creek, across the road from the main house. The mill was fashioned after a 17th century Devonshire cottage, complete with a thatched roof made from rye he grew himself. 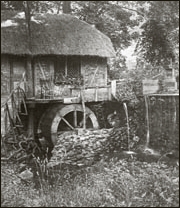 Not wanting to compromise his goal to manufacture paper using 17th century techniques, he relied entirely upon a water wheel to provide power to the mill. 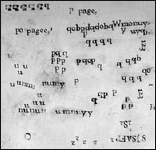 He quickly became very adept with the processes of papermaking and experimented with watermarking techniques and orders were coming in faster than they could be filled. Because paper could only be made in the summer months when there was ample water to turn the wheel, he decided to begin work on a font of type during the winter. Using engravers tools and files, Hunter spent four years cutting 63 punches which were then used to cast his entire font by hand. His goal was to capture the essence of the early typefaces which he felt ìpossessed a freedom of stroke unknown today.î Hunterís typeface is lively, rhythmic and sculptural. It was during his time at Marlborough that Hunter produced the worlds first one man book by creating a book that was printed by him on paper that he made with a typeface he designed, cut and cast himself. At this point he was on his way to making a truly harmonious book in which all aspects were carefully considered and planned from the beginning. In 1919, the Hunter family returned to Chillicothe and purchased the Mountain House, built in the early 1850’s. Although the house was constructed to meet the needs of the German winemakers, Hunter utilized the 1830’s wing for his letterpress printing studio which he appropriately named Mountain House Press. “The Etching of Figures” – the worlds first one man book. For the next 46 years, Hunter authored 20 books on the subject of papermaking (eight of which were printed by hand). These works were the result of over one million miles of travel to remote regions of the world in search of information on the craft. Dard Hunter died in 1966 at age 82. His Mountain House is now the center for Dard Hunter Studios, a business venture dedicated to raising the awareness of the contributions made by Dard Hunter throughout his lifetime. It is our goal to secure the long-term preservation of his home and working studio at the Mountain House and establish it as a living museum.